Child safe blinds – what are the options? So you could say that the dust is now settling in the aftermath of the hurried implementation of the new blind cord safety regulations. For a reminder of how the regulations change the soft furnishings landscape, take a look at our recent blog. Affected products – most notably roman blinds – won’t leave the market, but their application and operation has been largely curtailed. If you ever hankered after a manually operated roman blind above your kitchen work tops, think again as this is now illegal. Blind chains now have to be restrained to the wall and finish no less than 150cms off the floor (with some interesting if slightly impractical exceptions). Bottom up blinds are an interesting one – because in some quarters people will already be closing the chapter on this quirky product given the reach of the new child safety regulations. Bottom up blinds are the reverse of standard roller blinds in that the headrail sits on or close to the window sill, as opposed to at the top of the window. They tend to be operated by cords that raise the blind – and which are now outlawed under the new child safety regulations. It must be said that we have blogged about bottom up blinds rather disparagingly in the past because of their dependency on this rather unwieldy, unsightly pulley system to keep the blind in place. However in the last couple of years we have had a number of enquiries from clients – specifically requesting bottom up blinds but not wanting the clutter of all the cords. They like bottom up blinds because they give a certain degree of privacy (see photo above) without that feeling of hemmed in claustrophobia that floor to ceiling window treatments can sometimes give. Other alternatives include sheer panels, but these cannot be raised and lowered. 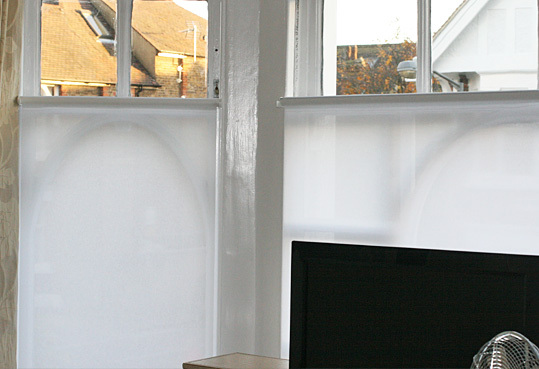 We were surprised to find that a non-corded system was not widely available, and so we developed our own, consisting of a sprung loaded roller blind cassette and hangers specially designed by the Moghul – that secure the blind at its desired point. Because there are no cords, this product is totally child safe – hurray! Spring loaded roller blinds – so called as they are powered by internal springs rather than by a manually operated chain – are also a product that has typically been viewed with caution in the past. However product innovations have brought spring loaded roller blinds to a level where they are effortless to operate and the slow rise and end stop functionality are such that our clients tell us that they actually enjoy releasing their blinds in the morning – to watch them gracefully, almost languidly rise to their top stopping point. And of course, because there is just one short central cord pull, these blinds are completely child safe. 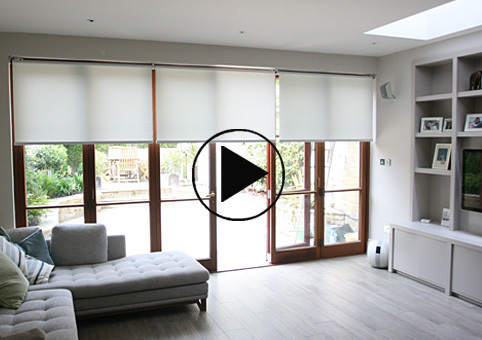 For those with slightly deeper pockets, electric or motorised roller blinds provide the ultimate solution. Child safety is a given as the blinds obviously have no trailing cords or chains. 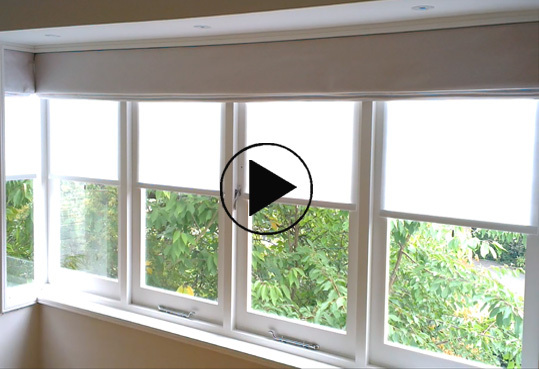 Motorised roller blinds come into their own on banks of windows (eg penthouse apartments or extensions with bifold or sliding doors) where multiple blinds can be raised or lowered simultaneously at the touch of a button – by dedicated remote handsets/wireless wall switches, or alternatively through a home automation system.